It turns out there was a miscommunication between the children’s director and the teacher, but that still meant someone was needed to help with the sixth-grade boys and girls. My husband was quick to respond and another woman was too. And I just sat there. I forced myself not to follow. Why? I knew I could get up to help. I was physically and mentally able to come up with a lesson on the fly. But deep down I knew I couldn’t. I had three children under the age of six. I homeschool. I write and blog. I lead our teen mom support group. I didn’t have one ounce of “extra” in me to give. It’s hard saying no. Really hard. The only easy way to do it is by understanding what we were called to say yes to. In my book Balanced I encourage readers to narrow down their “life themes” to eight. Why eight? None of us are just about one thing . . . and eight is enough to manage, believe me! What are your eight life themes? My husband loves children’s church. It’s his passion, and he took a break from it when we adopted our two new kids, mostly because the adjustment was huge. If he were to create a list of his eight life themes, children’s church would be on that list. Because I love John and enjoy children, I’ve supported him in this. Before adopting our new kids, I spent most Sundays working by his side, but in this season of life I just can’t do it. I need Sundays to get filled up so I can pour out the rest of the week. It’s a big list. It’s enough. I also have a passion for leading mission trips, and a time may come when I start helping John in children’s ministry again. But now is not that time. And I’m OK with that. I know Jesus has created me for a purpose in THIS day. In THIS season. How about you? If you’re like me there is a lot you CAN do. But what is God asking you to do in this season? What are your eight priorities? Look at your life. Currently what are your eight priorities? Write them down. Make a second list of things you need to say “no” to. Start saying “no” to everything except your current priorities. I thank you for all that you’ve given me. Lord, sometimes it seems too much. Help me to focus on the priorities that YOU have given me in this season. Also, Lord, help me to say “no” to other things, no matter how wonderful they seem. 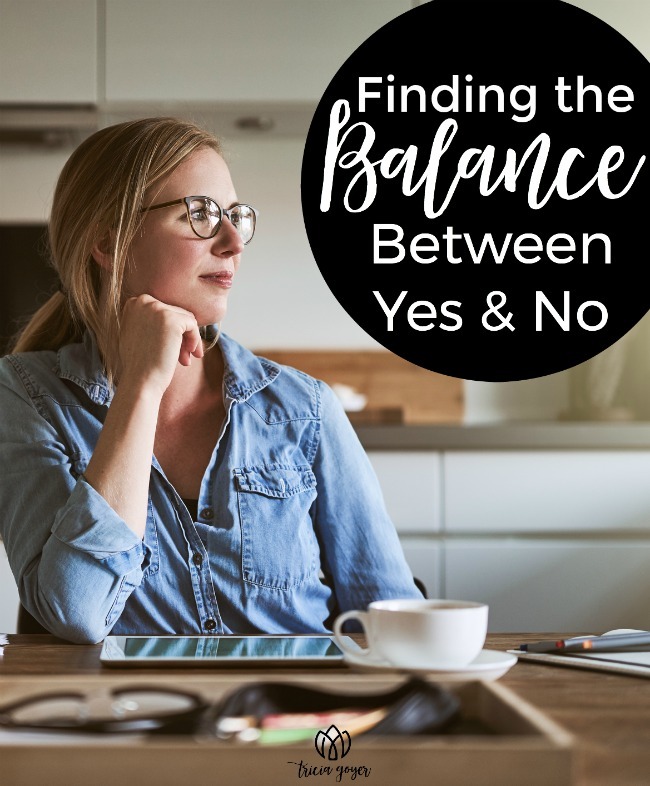 Do you need balance in your homeschool? Pick up a copy of Homeschool Basics. Receive tried-and-true homeschool advice from veteran homeschooling moms Tricia Goyer and Kristi Clover. We dish out practical help on getting started and staying the course. Homeschool Basics will remind you that the best homeschooling starts with the heart. Packed with ideas to help you push aside your fears and raise kids who will grow to be life-long learners. Kristi and I believe that homeschooling can transform your life, your home, and your family. Mostly, we believe homeschool can truly prepare your children for the life God’s called them to live. Don’t let doubts hold you back any longer. Hope and refreshment await. Find out more about Homeschool Basics and get your copy HERE. Thank you for the free book. I can’t wait to read it. Is this book available through Nook? I don’t own a Kindle, but would love to read this book. No, but I think I’ve heard that you can put the Kindle app on you Nook.